Hellebores, what would winter be without them? I'm writing to offer my apologies for neglecting you for over a week. It was not my intention to leave you with no new updates for such a long time but time slipped away from me. Rest assured, of course, that I have not been blogging elsewhere. I would never do that to you, my faithful blog who has been with me for well over ten years. What would I do without you? Where would I post my thoughts on gardening? Sure, there are other places where I can post about gardening, like Facebook, Twitter, and Instagram. But those sites don't really let me write so freely like you do, Dear Blog. You were my first real foray into social media and I will always remember that. I plan to be here with you for the long haul. After all, it was you who first helped me put my thoughts on gardening out where others could read them. And gosh, did we ever work together to put those thoughts out there. Some years, we posted over 300 times. Even though now we don't post as often, Dear Blog, rest assured, we'll still work together to put my thoughts on gardening out for others to see. 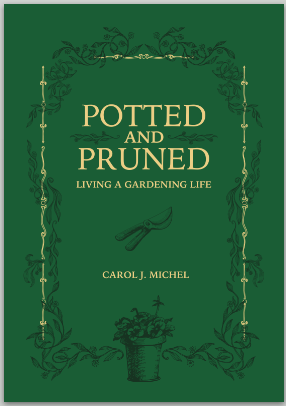 I will also be eternally grateful for all the assistance you provided in helping me put together my first book of gardening essays and letters. It was you, Dear Blog, who saved everything I wrote and made it easy for me to find those old posts, even ones I had forgotten about, and then pot them up and prune them nicely so they would look good in the book. Would you like to see a sneak peak of the cover the book you helped me create, Dear Blog? I'll show it to you, though right now it is just a picture and isn't available to be ordered. But very soon, it will be available to be ordered and then I'll look to you to help me get the word out about it. For after all, Dear Blog, I owe most of its contents to you. P.S. I would appreciate if you'd keep this just between us for now. The garden fairies have gotten word that they aren't really included in this book. I hope to provide them with their own book one day but until they see that book, they are a bit out of sorts about being left out of this one. Looking forward to holding a copy in my hands! A book! How exciting, Carol. Congratulations. Such a beautiful cover Carol. It will be a shame to cover it with a jacket. Can't wait to read it. Congratulations Carol! I will look forward to your finished book...so exciting! That's brilliant news! CONGRATULATIONS! I'm sure dear blog will forgive you! Love the title, and not surprised that the cover is green. Of course it would be! I wish you great success with the book. Sending that manuscript off to the publisher is one of the great feelings in life! 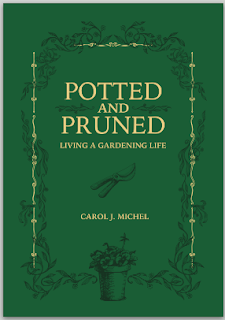 As Dee says though, lugging the books around can be a trial, but that helps develop those strong gardening muscles.